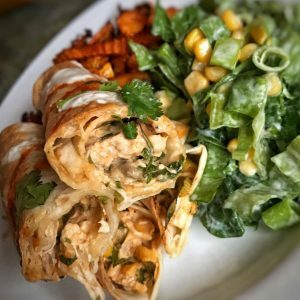 A Taquito is something I had never tasted or even heard of before I went visited Mexico and since it has been a whole year since we jetted off, I thought it was time to come up with another recipe inspired by my time there. A Taquito is simply a rolled up, stuffed tortilla. 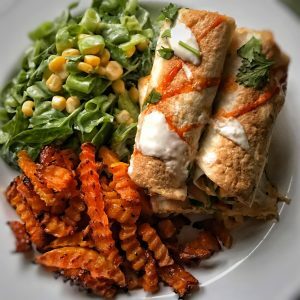 Usually fried, these lovely creations are rolled tighter and so are thinner than an enchilada, and the top is not covered in sauce in the same way an enchilada would be. When thinking about what to fill my Taquitos with, I thought I would get my other favourite find of the Mexico trip involved, Frank’s Red Hot Buffalo Sauce. I first tried this over there on chicken wings and many of you may have seen it used in my Buffalo Chicken Soup recipe. It really is the most delightful flavour. Spicy and tangy, it makes for a real taste sensation when added to chicken. The filling I’ve created below is truly delicious. Tangy, a little cheesy and stuff with veggies, this is a dish that will keep you full for hours. I served mine with BNS chips (0sp) however I was so full from two Taquito’s that I probably wouldn’t bother with them next time (or I would have one Taquito with the chips). I’ve used Sainsbury’s Be Good to Yourself Blue Cheese Dressing in this recipe (instead of the more points heavy crumbled Blue Cheese). If you can’t get a hold of it, or find a light equivalent somewhere else, just leave it out. The other flavours in the dish will more than make up for it. 8 x Weight Watchers Tortillas (these are 4sp each so if you can’t find these, any other 4sp equivalent will do, Tesco’s and Sainsbury’s are also 4sp). Pre heat the oven to 180c. Take a large bowl and add the cream cheese, buffalo sauce, blue cheese dressing and lime juice. Whisk together until smooth and then season with salt and pepper to taste. Add the rest of the filling ingredients and fold everything together. Taste again and check/adjust the seasoning. Take a large baking dish and spray with low cal cooking spray. Divide the mixture roughly into 8 in the bowl and then, one tortilla at a time, add the filling and roll longways so that they are nice and tight and relatively thin. Pop into the baking dish and repeat with the other 7 tortillas. Spray the top of the wraps with low cal cooking spray and then pop in the oven for 20-30 minutes (until the wraps have started to brown on top). While the Taquitos are cooking you can also roast some butternut squash chips (pop these in 10-15 minutes before the Taquitos) if you fancy them. I also served with a side salad which included iceberg lettuce, shredded spinach, a couple of chopped spring onions and a tablespoon of sweetcorn tossed in a tbsp. of the blue cheese dressing ( the same one used in the main recipe) and some lime juice. 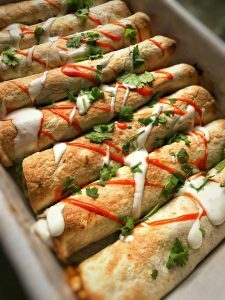 Once cooked, remove the Taquito’s from the oven and finish with a drizzle of Buffalo Sauce, light soured cream and fresh coriander. Serve with the salad and BNS if you are having them alongside a tbsp. lightest soured cream per person. Hi can I leave the blue cheese sauce out. I don’t mind. Little bit of cream cheese but any more cheese & it’s a no. Made this tonight. Loved the taste and texture. Used quark instead of soft chees and left out blue cheese dressing . Wonderful flavours, taste and texture. Thank you again for helping me rediscover my love of cooking. Another fabulous recipe. So tasty and different. Think it’s the first Mexican meal I’ve eaten with no peppers or tomatoes. I made this last night – absolutely amazing! So tasty and filling, even my boyfriend didn’t need seconds…and he would never have known it was a diet recipe. Just fabulous, thank you. Another night another successful SKS recipe. Delicious. I paired with retried beans …. so full! This was so delicious, my favourite recipe so far! Do you think the buffalo mix could be frozen?